I.M.W.S. Is a community based organization for the community and provides various services for the community. In the past we have purchased burial grounds in the local cemetery and used it for the burying of old religious articles, Qurans, Paras, Magazines, etc. This is very costly and inadequate for such a large community, buying one plot will cost approximately £750. In the past we have bought two plots at a time which in a matter of hours were filled and dozens of bags left. This is due to the fact we work closely with several Masjids and Madressas. Is it permissible to burn and bury the Holy Quran? Is it permissible to burn and bury Hadeeth? Is it permissible to burn and bury religious articles which have the Almighty Allah’s and the Holy Prophet Mohammed (s.a.w.) names in them? Firstly, it is important to bear in mind that as long as the Holy Qur’an is in a usable state it is not permissible to dispose of it whatever the means employed. It is permissible to dispose of the Holy Qur’an only when it has become extremely worn and has deteriorated to the level that it is no longer usable, provided that the method of disposal is consistent with due reverence and respect. 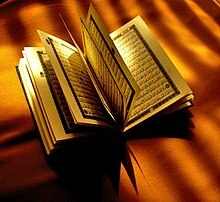 It is a clear symptom of the ignorance and the degeneration in respect of even Muslims today that it is now not unusual to find that many members of the Muslim community will seek to replace their ‘old’ copy of the Holy Qur’an with a new copy, when in fact the ‘old’ copy is very much in a useable state. The ‘old’ copy is then considered obsolete and in need of disposal. This is not at all permissible, but rather, it is a practice that must be rectified. If Muslim community leaders highlight this within their community, not only will this be a positive step in the promotion of due reverence, it will also greatly reduce the number of Holy Qur’ans in need of disposal. However, in the instance when the Holy Qur’an does become extremely worn and has deteriorated to the level that it is no longer usable, it should be disposed of with the utmost respect. The preferred method is to arrange for it’s respectful burial. As a community organisation that provides such a service, IMWS should explore the possibility of a designated burial site for Islamic literature, besides cemeteries, which will also not incur the prohibitive costs of cemetery burial plots. It may be possible to negotiate such sites with the local council or raise funds for such ventures from the Muslim community. Alternatively, where possible, such unusable Qur’ans may be weighed down and sunk in deep running water. There is a difference of opinion with regards to the permissibility or otherwise of burning the Holy Qur’an when it has become extremely worn and has deteriorated to the level that it is no longer usable. Those who consider it to be permissible cite the action of Usman (RA) who ordered the burning of all variant dialects of the Qur’an to that of the Qureysh. Usman (RA) did so in order to quell the disputes that had begun to arise amongst speakers of the different dialects. The Qur’an was transcribed into the original Qureyshi dialect and then distributed as the standard text.) They also contend that burning the Holy Qur’an also ends the possibility of any form of denigration in the future. Those who consider it to be impermissible contend that burning the Holy Qur’an is a form of denigration. Imam Muhammad RA has indicated that this is the Hanafi position. In answer to the actions of Usman (RA) they explain that Usman (RA) burnt only those scriptures that were established to be not of the Holy Qur’an, or that were indistinguishable from the Holy Qur’an. Furthermore, the only possible way to rid the Muslims of their disputes was to take the drastic course of action that Usman (RA) did. The Muslims of the time saw this need and approved of his actions. In fact, Ali(RA) positively forbade anyone to say anything but good about Usman (RA) in this matter. Therefore, the idea of burning unusable copies of the Holy Qur’an using an incinerator should not be easily entertained as this carries with it connotations of disrespect. If Muslim communities readily resort to such measures, it can quite easily become a licence for those who wantonly desecrate Islamic literature.However, if after educating the community and exhausting all possibilities of respectful disposal through burial etc, the needs of the community can still not be met, a via media could possibly be to remove the inscription of the Holy Qur’an using suitable solvents and then burn the remaining papers using an incinerator. It is still better to then bury the ashes. The preferred option is burial followed by disposal in deep flowing water as mentioned in no. However if the names of Allah, His Angels and Messengers are removed, the rest may be burned. Same rules and principles apply to all of your queries. و فيها: المصحف إذا صار خلقا وتعذرت القراءة منه لا يحرق بالنار , أشار الشيبانى إلى هذا في السير الكبير , و به نأخذ , كذا في الذخيرة . و قال الإمام بدر الدين العينى فى عمدة القارى : و قال الكرمانى : فإن قلت : كيف جاز إحراق القرآن؟ قلت : المحروق هو القرآن المنسوخ أو المختلط بغيره من التفسير أو بلغة غير قريش أو القراءات الشاذة , و فائدته أن لايقع الاختلاف فيه , قلت : هذه الأجوبة جواب من لم يطلع على كلام القوم و لم يتأمل ما يدل عليه قوله فى آخر الحديث و قال عياض : غسلوها بالماء ثم أحرقوها مبالغة فى إذهابھا , و عند أبى داؤد و الطبرانى : و أمرهم أن يحرقوا كل مصحف يخالف المصحف الذى أرسل به , قال : فذلك زمان أحرقت المصاحف بالعراق بالنار ,و فى رواية سويد بن غفلة عن على قال : لا تقولوا لعثمان فى إحراق المصاحف إلا خيرا و فى رواية بكير بن الأشج : فأمربجمع بجمع المصاحف فأحرقها ثم بث فى الأجناد التى كتبت , و من طريق مصعب بن سعد قال : أدركت الناس متوافرين حين أحرق عثمان المصاحف , فأعجبهم ذلك أو قال : لم ينكر ذلك منهم أحد . و قال ابن بطال : فى هذا الحديث جواز تحريق الكتب التى فيها اسم الله بالنا و إن ذلك إكرام لها و صون عن وطئها بالأقدام , و قيل: هذا كان فى ذلك الوقت و أما الآن فالغسل أولى إذا دعت الحاجة إلى إزالته و قال أصحابنا الحنفية : إن المصحف إذا بلى بحيث لا ينتفع به يدفن فى مكان طاهر بعيد عن وطء الناس . قال الإمام الحصكفى في الدر المختار: الكتب التى لا ينتفع بھا يمحى عنها اسم الله وملائكته ورسله ويحرق الباقى , ولا بأس بأن تلقى في ماء جار كما هى أو تدفن وهو أحسن كما فى الأنبياء .